The anticipation of receiving a new lens always brings on a smile. Most lenses generate a smile when you open the just-arrived box - concluding the anticipation. Some lenses bring a smile to your face when, upon removing them from the box and during use, you realize their build quality. And some lenses bring a big smile to your face when you see the results they produce. The Zeiss 100mm f/2 Makro-Planar T* ZE Lens completely covers all of these categories. The Zeiss 100mm f/2 Makro-Planar T* ZE Lens is exceptionally well built and delivers image quality to match. There are two things I will note before continuing this review. The first is that, like the rest of the Zeiss ZE Lenses, the Zeiss 100mm f/2 Makro-Planar T* ZE Lens is a manual-focus-only lens. The other is that, though it is a macro lens, the Zeiss ZE 100mm Macro offers only a 1:2 maximum reproduction ratio instead of the far more common 1:1 maximum reproduction ratio of alternative macro lenses. The 1:2 ratio means that a subject is rendered at 1/2 life size on the sensor. This is of course means the subject is rendered far larger than life size on a monitor or large print. I discovered this scene near our house simply by taking a different road home from one of the kids' events. This picture was taken late in the morning using a Circular Polarizer Filter. The Zeiss 100mm lens obviously can be used as a landscape lens (an excellent one, actually). The 100mm focal length is an ideal one for portraits with a full frame camera and is still quite good for tight portraits on an APS-C 1.6x/1.5x DSLR. The Zeiss 100's capabilities make it a great product and still life photography lens. While the lack of autofocus will make keeping action in focus difficult for many, the wide f/2 aperture will do its part in freezing the action captured. The Zeiss ZE 100 will work well, even handheld, in low light scenarios including indoors - as long as you can keep your subject in focus. And if you are shooting a f/2, the shallow DOF (Depth of Field) makes manual focusing even more challenging. 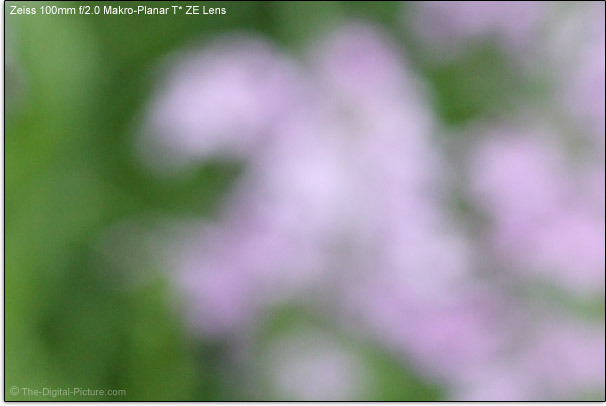 But, this shallow DOF is a great feature of the Zeiss 100mm f/2 Makro-Planar T* ZE Lens. 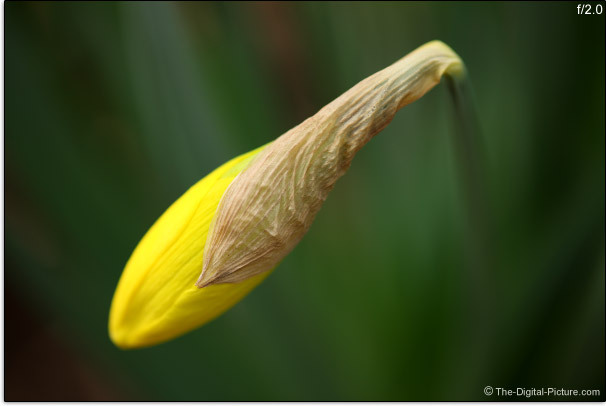 The 100mm focal length combined with the wide f/2 aperture and a short focus distance will melt the background away. 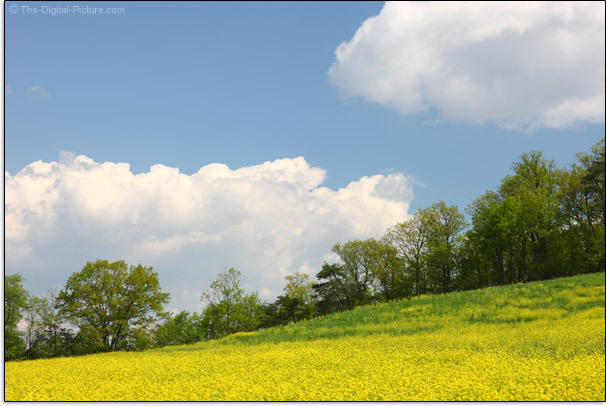 Here are some aperture examples captured on a Canon EOS-1Ds Mark III. Use the shallow DOF to very effectively isolate your subject from even distracting backgrounds. The alternative macro lenses generally have f/2.8 max apertures. The Zeiss can stop action in 1/2 as much light as the f/2.8 lenses and will create a noticeably stronger background blur at f/2 (compare the f/2.0 and f/2.8 examples above). The Canon EF 100mm f/2 USM Lens shares the focal length and aperture of the Zeiss 100mm f/2 Makro-Planar T* ZE Lens, but it has a significantly longer MFD (Minimum Focus Distance). The most impressive aspect of the Zeiss ZE 100 Macro is the image quality it delivers. This lens is very sharp wide open - completely to the extreme full frame corners. Stopping down typically improves a lens' image quality, but you are not going to see a significant difference with this lens stopped down. Improvement is not needed - expect to be impressed. Just over two stops of vignetting/peripheral shading is present in full frame corners at f/2. Stopping down the aperture to f/2.8 removes one stop and stopping down to f/4 removes the rest. You can see this vignetting in the aperture examples above, or as always, in the vignetting tool. 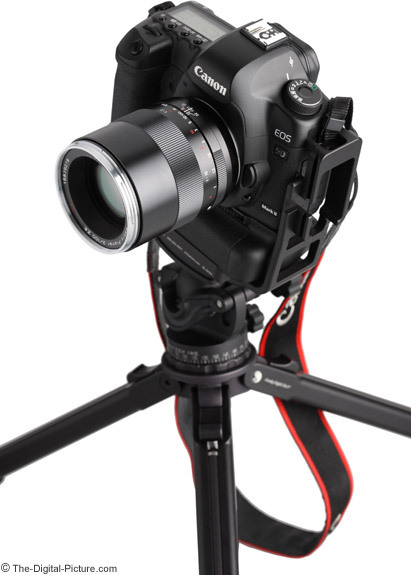 APS-C 1.6x/1.5x DSLR users will see close to 1 stop of vignetting in the frame corners at f/2. This is gone at f/2.8. The Zeiss ZE 100 Macro is practically CA (Chromatic Aberration)-free and is essentially distortion-free. Even with the sun directly hitting the corner of the frame, the ZE 100 shows very little flare. Bokeh (quality of background blur - not the amount blur) is quite impressive. Here is an example of the ZE 100's f/5.6 bokeh along with a same-focus-distance example from the Canon EF 100mm f/2.8 L IS USM Macro Lens. Both examples show great bokeh with the Canon showing very slightly more blur. As I mentioned at the beginning of this review, the Zeiss ZE 100 Macro is a manual-focus-only lens. 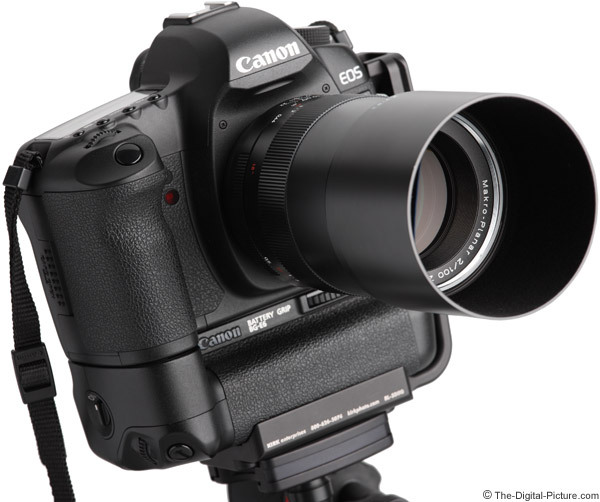 As you can see above, the ZE 100 extends significantly during the also significant 350° full extent manual focusing rotation. In comparison, the Canon EF 100mm f/2.8 L IS USM Lens full extent manual focusing rotation is 157° (and it focuses significantly closer). The good: Having a long focus ring rotation allows super precise focusing. The not so good: it takes more effort to change the focus distance from minimum to infinity - this includes retracting the lens for storage. The very-nicely-sized focus ring remains centered on the extending barrel, is exceptionally smooth and is very well damped with no absolutely no play. The front element does not rotate - an important feature when using some filters including circular polarizer filters. An extensive etched and painted distance scale is provided in both ft and m on the focus ring. A DOF scale for f/11, f/16 and f/22 extends up the barrel. Focus breathing is not significant over modest focus distance changes. The minimum focus distance and maximum magnification comparison chart above shows that the similar focal length Canon f/2 lenses cannot touch the Zeiss ZE 100's MFD/MM, but that the Canon macro lenses have significant MFD/MM advantages. Let's take a closer look at maximum magnification values. 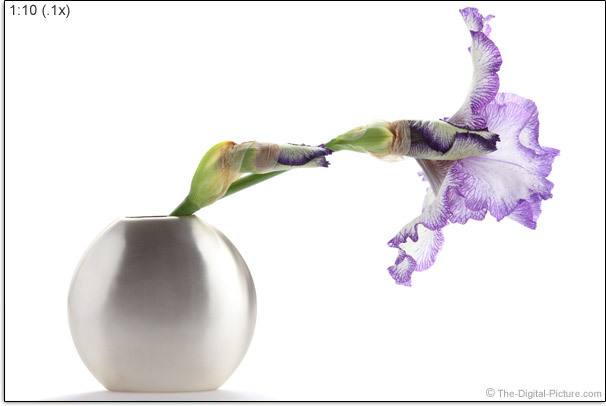 The following examples of a large iris were taken with the Zeiss 100mm f/2 Makro-Planar T* ZE Lens on a full frame body. Use the mouseover labels below the image to see the specified ratio. Few lenses have a maximum magnification value lower than 1:10 (.1x), so the 1:10 ratio example is essentially worst case lens MM. The Canon 100mm f/2 has a .14x MM spec, which is very close to the 1:7.5 example. The 1:5 ratio (.2x) is not uncommon for today's lenses and 1:4 (.25x) is near best case for non-macro lenses. The 1:2 (.5x) example of course represents MM for the Zeiss ZE 100 and the 1:1 (1.0x) example (simulated here) is representative for most true macro lenses. Following is a size and weight comparison chart reviewing where the Zeiss ZE 100 Macro stands among Canon's most-similar lenses. For many more comparisons, review the complete Zeiss 100mm f/2 Makro-Planar T* ZE Lens Specifications using the site's Lens Spec tool. Aside from the lighter Canon 100 f/2, the Zeiss ZE 100 Macro is not significantly different in size and weight from the other lenses compared here. It is a medium-sized lens that feels really nice in your hands - thanks especially to the differentiating, Zeiss ZE-standard, all-metal construction including the metal-ribbed focus ring. The focus ring is the only exterior moving part on this lens - you will find exactly zero switches. Without AF and IS, the usual switches are not needed. Gravity-extending is not an issue - no extension lock is needed. When retracted, the Zeiss 100 lens barrel is primarily focus ring with just enough area behind it to grasp the lens for installation/removal. I of course can't promise that a lens will provide a lifetime of solid performance, but the Zeiss ZE 100 Macro, with its impressive build quality and lack of potential failure points, is one I would expect to perform superbly, indefinitely. The ZE 100 should be a very good investment. The ZE 100's 67mm filter size is not large, is moderately common and has an additional macro benefit - it accepts the Canon 67C Macrolite Adapter. With the Macrolite Adapter in place, the Canon Macro Ring Lite MR-14EX Flash and Canon Macro Twin Lite MT-24EX Flash become usable on the Zeiss ZE 100. In the first image, the ZE 100 appears rather compact compared to all but the Canon 100 f/2. In the second image, all lenses are set to their MFD. The ZE suddenly becomes the tallest lens in this group. With lens hoods added, the ZE 100 falls back in line with the rest of the group - thanks to the relatively compact size of its hood. The narrow hood design is very space efficient when stored reversed. A downside to this design is that installing the Zeiss lens cap is somewhat difficult when the hood is in place (there is not enough grip surface on the center-pinch mechanism). The ZE 100 hood is metal with anti-reflective flocking inside. It very precisely fits onto the lens. All of this build quality and image quality sweetness does not come without a price. One of the great features of quality lenses is that (generally) you can buy them, use them for years, and sell them for nearly what you paid for them (and sometimes more). Many will find the Zeiss 100mm f/2 Makro-Planar T* ZE Lens worth the cost, but most will at least consider the alternatives. 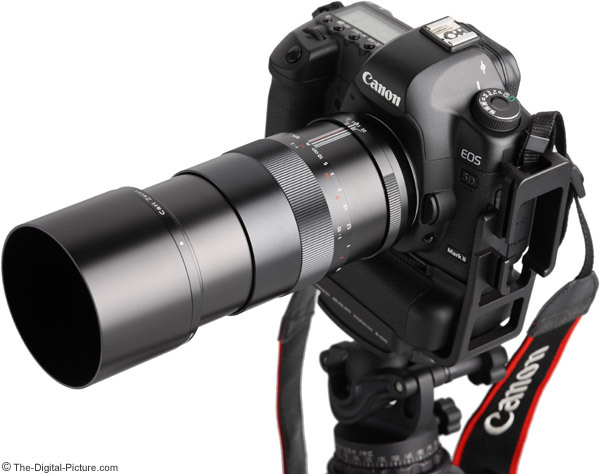 The primary alternative will be the Canon EF 100mm f/2.8 L IS USM Macro Lens. 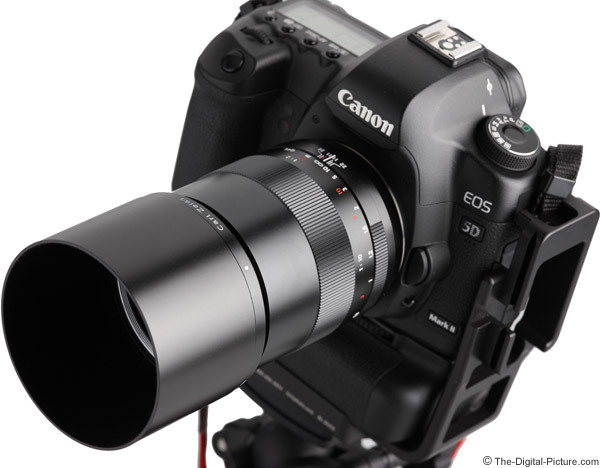 Both are excellent lenses, but let's review some of the differences. The Canon's major advantages are that it has autofocus, image stabilization, weather sealing and a very-significantly-lower price tag. 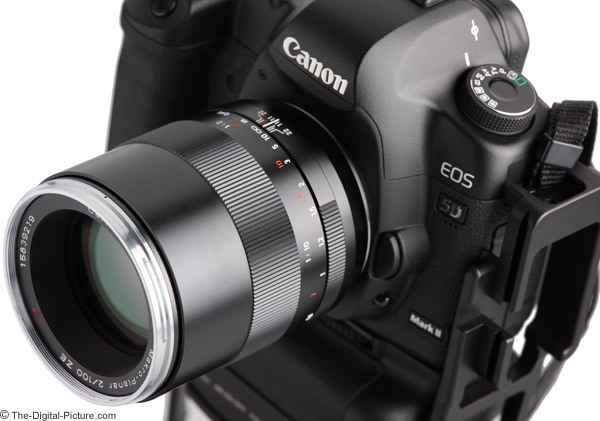 While the Canon is not poorly built, the Zeiss metal construction feels more solid. The Canon does not extend when focusing, but it is larger than the retracted Zeiss - meaning that storage requirements are different. The lens hood shape also gives the Zeiss a storage advantage. 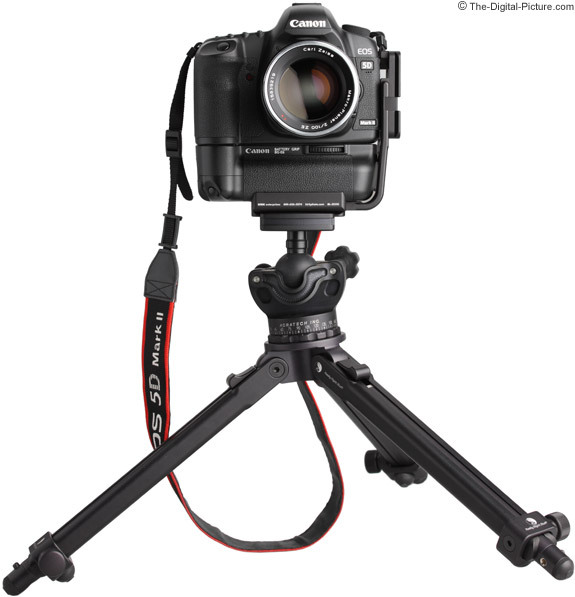 The Canon accepts an optional tripod ring (I find these very helpful). The Zeiss has far more focus ring rotation - it is very noticeably better for precise manual focusing (but slower for large focus distance changes). Overall image quality from both lenses is exceptional. The Zeiss has less vignetting at f/2.8 and f/4. 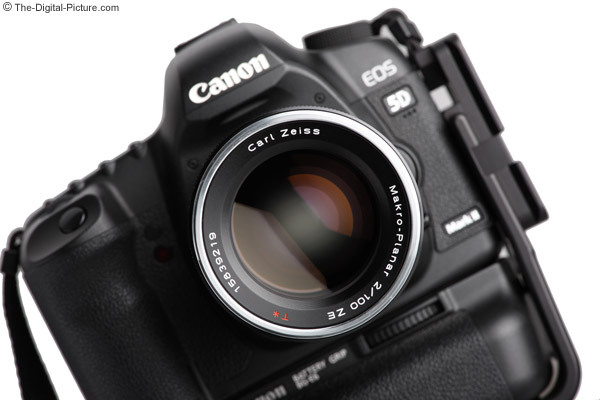 The ZE (Canon EOS) Mount of the Zeiss 100mm f/2.0 Makro-Planar T* Lens was used for this review. 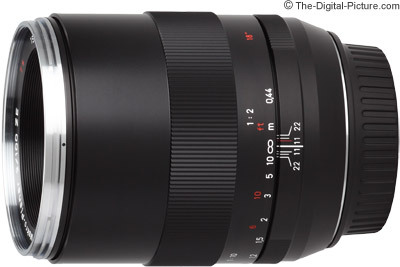 This lens is also available in Nikon F Mount (Zeiss 100mm f/2.0 Makro-Planar T* ZF.2 Series Lens). The Pentax K-Mount version (Zeiss 100mm f/2.0 Makro-Planar T* ZK Lens) has been discontinued as of review time (according to B&H). The reviewed lens was purchased directly from Zeiss through a special purchase program. You put a lot of time and effort into your photography - you want a lens that is going to make that time and effort worthwhile. The Zeiss 100mm f/2 Makro-Planar T* ZE Lens is one of those lenses.